Soy has been linked soy to a number of health benefits, including protection against certain types of cancer and lower cholesterol levels. These benefits have been largely attributed to a substance in soy known as isoflavones. These compounds, which mimic human estrogen, are the focus of much of the research on soy and human health. While soy isoflavones may have certain health benefits, high consumption of these compounds may also increase the risk for certain cancers. Most sources recommend eating soy foods in moderation and avoiding soy based supplements. Isoflavones, active substances in soy based foods, are a class of phytoestrogens -- compounds that exist in plants structurally similar to estrogen that have estrogen-like properties. Once in the body, these phytoestrogens behave like human estrogen. In some tissues they can mimic the effects of estrogen and in other tissues they can do just the opposite -- block estrogen. Because the effects of isoflavones are not fully understood, there is concern about their long-term effects on the human hormonal system. Estrogen is a hormone that can cause breast cancer in humans and animals, notes the Sprecher Institute for Comparative Cancer Research at Cornell University. As a result, there is concern about the potential for high intakes of the estrogen-like compounds, such as soy isoflavones, to negatively affect breast cancer survivors. According to University Of Maryland Medical Center, some research shows that soy can stimulate the growth of breast cancer cells. The Linus Pauling Institute notes that, although the data in this area is conflicting, they do not recommend that breast cancer survivors eat high amounts of isoflavone-rich foods. In addition, pregnant mothers are advised to avoid isoflavone-rich diets due to the lack of research done on the effects of soy on fetal development. According to the Sprecher Institute, while the relationship between breast cancer and soy isoflavones has been studied in different ways, research has failed to provide clear answers regarding their effects on breast cancer risk. It is recommended to eat soy foods in moderation and avoid soy-based supplements. Penn State College of Agricultural Sciences explains that soy supplements, such as soy protein, can have different effects on the body because they often contain higher levels of isoflavones. A safe intake of soy isoflavones is between 35 to 55 milligrams per day, advises Penn State College of Agricultural Sciences. The school notes that others suggest a safe upper limit of 100 milligrams per day. Approximately two to three servings of natural soy foods per day is considered safe. 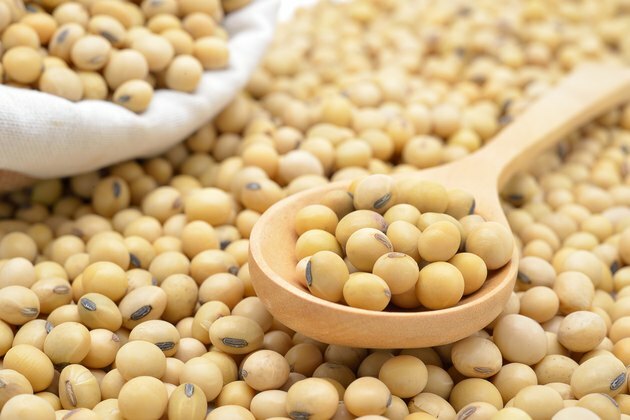 Per 3.3 ounce serving, boiled soybeans contain the highest level of isoflavones, with 54 milligrams, followed by tofu at 28 milligrams and soy hot dogs at 15 milligrams. One 8-ounce cup of soy milk contains 24 milligrams of soy isoflavones.